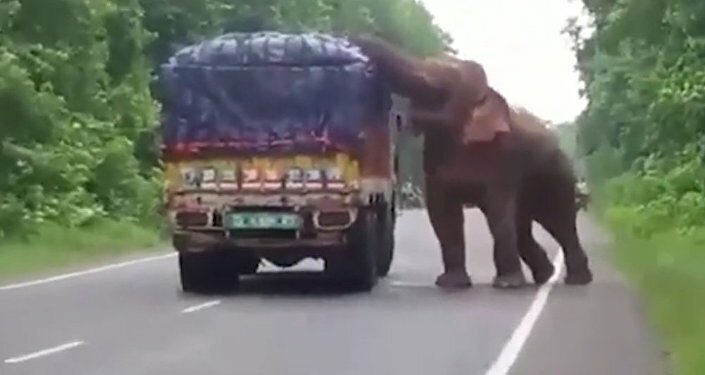 Hitting the last nail in the coffin, the Indian government has imposed a complete ban on the use of wild animals, including elephants, in tricks and other performances. The use of bears, lions, tigers, panthers etc was banned in 1998 but elephants were allowed until now. New Delhi (Sputnik) — Elephants are often exploited for doing meaningless tricks for the entertainment of humans. Peddling cycles, juggling balls, balancing on two limbs were a common sight in Indian circuses. However, reinforcing the country’s resolve to check cruelty to animals, the Indian government has banned inhumane confinement and torture-taming of elephants for use in tricks performed at circuses and other forms of entertainment. India’s Ministry of Environment, Forests and Climate Change (MoEFCC), in its latest orders, has canceled the recognition of all circuses which were found guilty of torturing wild animals including elephants by locking them in cramped cages and thrashing and intimidating them to perform tricks that are unnatural to their inherent characteristics. In 1998, the Indian government had banned the exhibition of wild animals including bears, monkeys, tigers, panthers, and lions. Elephants were excluded from the ban, though protected under Schedule I of The Wildlife Protection Act, 1972. The decision to include elephants in the list was taken by the Ministry’s Central Zoo Authority (CZA) after a year-long survey which concluded circus owners meted out extremely inhumane treatment to the animals at their disposal. The zoo authority has also directed the chief wildlife wardens of states to rehabilitate the elephants from derecognized circuses. The inspection team found that the elephants could hardly move because of injuries and pain. They were chained and banned pointed metal sticks were used to train them. With the cancellation of their recognition, circuses that used elephants as their mainstay are now facing the threat of closure. Circus owners are crying foul, accusing the inspection team of bias. They had taken the legal route last year to appeal against a similar survey conducted earlier submitting to the court that a ban would create job loss and livelihood issues. In response, the judiciary had asked the government to conduct a resurvey. However, the resurvey too reported similar violations, paving way for the Ministry to deregister popular circuses like the Apollo Circus and the Great Golden Circus. The Ministry has claimed that circus owners were given ample time to improve conditions for the animals in their custody but that they flouted the deadline. People for Ethical Treatment of Animals (PETA) has welcomed the step but with caution. “Though this initiative is in the right direction to prevent the abuse of wild animals for human entertainment, it is not a permanent ban. Inspections revealed widespread and rampant cruelty to animals in circuses and horrific conditions under which they are housed in violation of animal protection laws,” head of PETA Pubic Policy team Nikunj Sharma told Sputnik. “Unless an amendment is made to the Wildlife Protection Act, 1972, removing the circuses from the list of establishments that are recognized by the Central Zoo Authority (CZA) this ban is can just be called a limited one,” he added. PETA tried to dismiss the circus owners’ submission in the court regarding the loss of livelihood due to the ban. “Livelihood can never be a justification for cruelty on any living being. More and more people today know that circus means cruelty to animals and want no part in it. People are not going to the circus because they don't want to see animals suffer,” Nikunj Sharma told Sputnik. He was of the opinion that human-only circuses would require more humans to be hired and in the process would create more jobs.